Call reported smoke and flames seen on boat in harbor. Ketchikan, Alaska - The Ketchikan Fire Department responded to a report of a boat fire on float 8 Bar Harbor, behind Bar Harbor Restaurant on Saturday. The commercial fishing vessel "Sable" had heavy smoke venting from the open cabin door and also from a starboard window on the rear of the cabin. 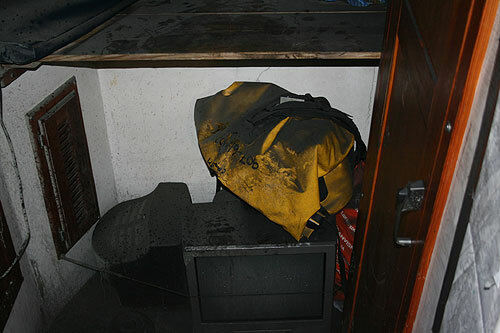 The City of Ketchikan Harbor Master, bystanders, and other neighboring boat owners used dry chemical extinguishers and a garden hose to control the fire before KFD personnel arrived. The fire department responded to the call at 3:52 PM. Electrical shore power supply wiring behind the stove appears to have burned through the wire insulation. 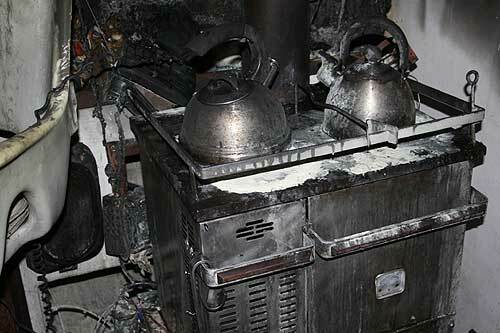 According to information provided by Ketchikan Fire Department Chief Jim Hill, cause of the fire was electrical shore power supply wiring behind the stove appears to have burned through the wire insulation. Fire vented up through a 4-inch diameter hole in the shelf above the wiring and melted a plexiglas window. The boat owner, Tom Carruth, stated he had just been down to the boat earlier in the day to plug in a heat lamp in the foc'sle area while he already had a small portable heater turned on under the galley table said Hill. Hill said both the heat lamp and heater were found not to be involved as a heat source contributing to the cause of the fire however the additional electrical load on the shore power connector may have caused overheating of the electrical wiring on the vessel side of shore power connection. The approximate value of his boat is $100,000. Estimated damage to vessel is $10,000 said Hill. Damage to vessel is limited primarily to smoke damage to the cabin area interior, some charring behind oil stove, melted plexiglas window, as well as radios and other electronics said Hill. Responding vehicles included Engine-2, Engine-1, Rescue-1, Fire/Boat Harry Newell (standby), FD1, and Medic-1. Along with Ketchikan Fire Department, Ketchikan Police Department, and Harbor Master, the United States Coast Guard small boat station responded with the 47' response vessel to assist. A total of 14 Ketchikan Fire Department firefighters and support personnel responded to the call. No injuries were reported said Chief Hill.